Every theme includes a background. The background can be plain white, a solid or gradient color fill, a texture or pattern fill, or a picture. When you change to a different theme, the background is replaced. Background colors are defined by theme colors. Therefore, if you change the theme color scheme, PowerPoint updates the background to reflect the new theme colors. If you like a particular theme with its color scheme and fonts, but you want a different background, you can quickly apply a different background to all slides or to a selection of one or more slides. On the Design tab, in Customize, click Format Background. Select among the Solid, Gradient, Picture or Texture, or Pattern fill options to create the background style that you want. On the View menu, click Normal, and then in the navigation pane, click the slide or slides that you want to change. Click Fill, and then click the Solid, Gradient, Picture or Texture, or Pattern option. Choose the background fills that you want. 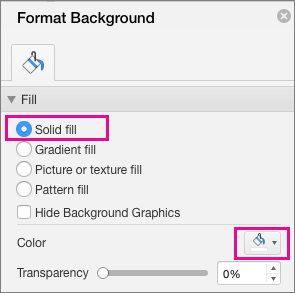 Note: To later remove custom backgrounds and apply the default background for the theme to all slides, click the Solid fill option in Format Background. On the Theme Colors pop-up menu, click Automatic, and then click Apply All. Click Solid fill, click Color and then select the white background in Theme Colors. Tip: If you have trouble removing the background using the previous steps, see Hide background graphics on a slide. On the Themes tab, under Theme Options, click Background. Select the background style that you want. In the navigation pane, click the slide or slides that you want to change. In the top of the navigation pane, click the Slides tab, and then click a slide. To select multiple slides, hold down as you click the slides. Depending on the width of the navigation pane, you will either see the and named tabs or the Slides and Outline icon tabs. On the pop-up menu, click Format Background. In the sidebar, click Fill, and then click the Solid, Gradient, Picture or Texture, or Pattern tab. 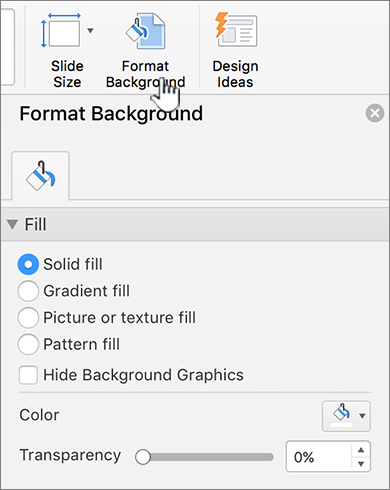 Note: To later remove custom backgrounds and apply the default background for the theme to all slides, click the Solid tab. On the Color pop-up menu, click Automatic, and then click Apply All. Click the white background style.